This afternoon in the Athletic Complex, the Wilfrid Laurier University department of athletics and recreation held a press conference to announce the incoming head coach of the men’s basketball team, Justin Serresse. After 16 years, the memorable coaching career by Peter Campbell has come to an end and the debut of Wilfrid Laurier’s tenth head coach begins. 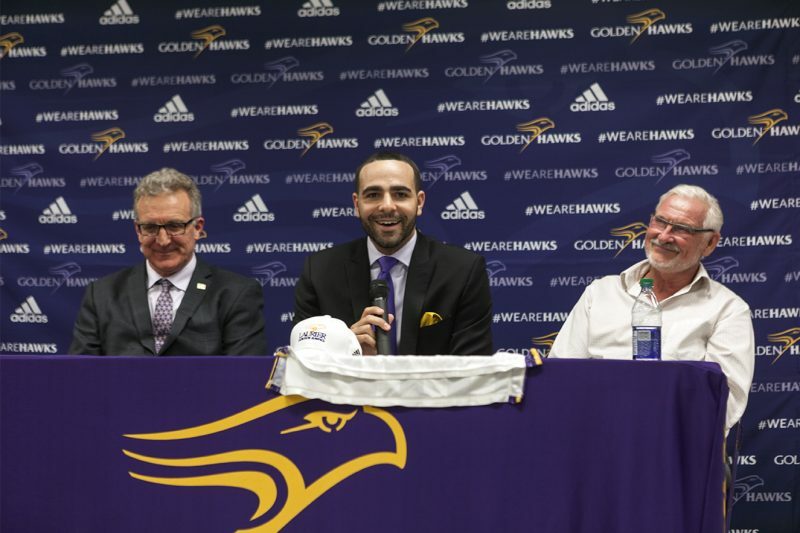 With open arms, Justin Serresse, the Ottawa Gee-Gees former lead assistant coach, was welcomed into the Golden Hawk family. For six years, Serresse served under head coach James Derouin with the Gee-Gees men’s basketball program, creating a provincial powerhouse. As a former Laurentian University basketball player, he graduated with an undergraduate degree in Sports Administration and continued his studies with a master’s in Sports Administration at the University of Ottawa. Riddled with experience, prior to his time with the Laurentian Voyageurs, for two years Serresse played overseas with Spo Rouen Espoir Pro B and Pro A in France. Serresse has already planned a course of action for his team, but is currently focused on bonding with his new team. “It’s all about trust and relationship, me being able to be on the floor with them, doing individual work,” said Serresse. Alongside his Euro-ball experience, Serresse is the head coach of the U19 Next Level club team and also volunteers his time as a coach with the Canadian Basketball Academy. He has been able to have a solid impact on his previous teams by creating an ideal offensive presence across the court. “I’m from Europe, so we like the spacing and the shooting and the fast paced basketball. That’s what I like to see,” said Serresse. With a strong passion for the San Antonio Spurs, coach Serresse envisions plenty of potential with the Golden Hawk team. “We’re going to start with our defence, so we can create a transition game and offensively, the same offence that coach Campbell used to have in the past years,” Serresse said. As far as a fan engagement strategy, Serresse seems to have an eye on recruitment processes and tactics. “You have to be out there; you have to show your face. just being everywhere, talking to people, networking,” explained Serresse. The future looks bright for the men’s basketball team in the eyes of Laurier Athletics and the new leverage from their coaching staff. Peter Baxter, director of athletics and recreation is hopeful about the new addition to Laurier Athletics. “Having Justin as a young energetic player that’ll be hard driving with his players,” Baxter said.